Not much exciting going on here but thought I'd write a quick post about my training lately. I feel like I'm just trying my hardest to maintain fitness and gradually up the mileage while trying to get through another record breaking hot summer. I'm talkin', 85 degrees and humid at 5:30 am hot. Blech. So I've been getting up early or running late and have been hovering around 32 miles per week. This week it goes up to 40 mpw and keeps increasing after that to a peak week of 56 mpw. My training is focused on Whispering Pines 50K which is October 13th, and will then shift to Rocky Raccoon 50 mile in February. Food is one of the most important components of training for me and I'm eating as many fresh, organic fruits and vegetables as I can get my hands on. Still drinking a big green smoothie every morning for breakfast loaded with hemp & pea protein, greens, carrots and fruits along with some Matcha green tea powder, coconut flakes and chia seeds. My recovery is definitely much quicker now that I've started incorporating the smoothies, maybe I wasn't getting enough of something before? Lunch is typically leftovers from the night before heated up (roasted chickpea tacos, black bean soft tacos, stuffed quinoa peppers etc) and dinner is often poached eggs with toast or an egg sandwich. I also try to eat snack foods that are anti-inflammatory such as pineapple for the bromelain or cherries and a handful of nuts. Now that I've started running ultras, for me the main thing is getting through the training still healthy and stronger. It's so easy to burn yourself out or get injured during the long months of training and high mileage and I feel like I'm getting better with the balancing act but only by staying very in tune to my body and adjusting when I need to. Would love to hear from other runners on what they do during training that helps them get stronger and keeps them healthier! That's an impressive diet. Light years ahead of mine. I have a green smoothie for breakfast...and then its all downhill from there. I have a 50k in October. I often get injured while training for longer races, so the plan is to go back to back on the weekends without ever running more than 3 hours at once, and never more than 45 miles per week. Add frequent core tabatas and some cycling to the mix. Will I be under-trained? Maybe, but for once I would like to actually make it to the start line of an ultra. Are you running Pumpkin Holler, Brian? I have overtrained for races and I've undertrained for races. Of the two, I definitely prefer undertraining! Although, I would someday like to get it jusssst right! I like your idea of not running more than 3 hours at once but running back to back, that is what I'm doing differently this time. Last time I trained I ran one super long run on the weekend and would run for 4-5 hours. This time I'm doing the back-to-back runs and shortening them. So far it's working and I feel great. Fingers crossed! Pumpkin Holler it is, with a warm up with Flatrock 25k. Good luck with Whispering Pines. I Look forward to reading how your training works out. I'm currently training for my first 50K (Palo Duro) and am learning just how important good nutrition is for trail running. I made sure on Sunday's 22 miler that I ate "real" food during the run--and it made a HUGE difference. I had so much more energy afterwards and wasn't completely wiped out like I usually am after a really long run. On the flip side, I just ran my first 48 mile week and am feeling pretty beat up. I'm liking the discussion above about shorter back-to-back runs . . .
You are going to love Palo Duro! 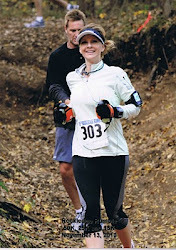 I ran the 50K there last year and loved (almost) every second of it. :) I'll be there this year just doing the 20K and hope to see you! I know what you mean about real food..makes all the difference! I've made my own energy bars to take on a long run with good success, and love dates, grapes and cashews on a run. The gels don't stick with me long and I get low blood sugar about an hour after taking one. Real food sticks with me longer. If you haven't already, maybe you could write a post about your homemade energy bars and post the recipe. I would love to know how you make them! I'd be glad to! I will find some of my recipes and post them. I got one really good from NoMeatAthlete.com and another one came from the book Thrive by Brendan Brazier. Will you post your recipe for the green smoothie? I'm making a modified smoothie from Scott Jurek's book but I'm bored with it. Sometime in the next couple of months I'm going to come run with the Trail Runners. When I see you I'm going to give you a huge "virtual" hug for this! This morning I ran 12 miles with the Okc Landrunners. My god I was energized. The first 6 miles were wonderful. I just couldn't believe the energy I had. I just started running in April and today was a personal best for me. I like to think the smoothie (along with some other techniques) helped with my recovery. It's now about 5 1/2 hours later and I'm not in a fraction of the soreness/pain I was last week after only 10 miles. The only thing I left out this morning was the orange and avocado, but I did add the chia and sunflower seeds. Thank you SO much!! Happy trails. Your smoothie is so full, and complicated! What kind of blender can take on carrots? And how long does it take you to drink it? I make protein powder with berries and lemon. Used to throw in spinach, but now just go easy so I can leave for work:) Doing awesome! And I hear ya on the mornings of 85F and humid! If you use those baby carrots from Whole Foods it isn't a problem. I bought a 5-pack in the organic section and had no problems with them integrating into the smoothie. On the days that I'm out of fresh produce or just in a BIG hurry I throw in my protein powder, some frozen organic fruits & berries and am out the door. All the other stuff just helps me even out my diet and get all those nutrients that I might not get otherwise. My skin looks fresher and my recovery time has gotten a lot quicker since I started making these about 6 months ago. I'm not sure of the exact reason but suspect it's that I'm finally getting all of the vitamins and nutrients that my body needs to perform well. It's finally cooling off here and we've even had some rain and fall-like weather! Hope it's cooling off there too and that you have a nice long fall! I've heard of VitaMix:) You're doing great!